Paintclub Galway - "Through the Mist"
You must be a member of the Dublin to Galway Group to attend this activity. Would you like to join this group? Hello those who like to paint or want to give it a try. Details below and on Paintclub website. 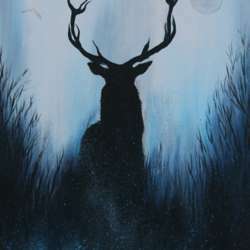 "Join us to banish those January blues with some painting and pints or prosecco or cocktails on Protected content where we’ll be creating this gorgeous and super easy Stag painting ‘Through the Mist’. Kicking off at 7pm, grab a drink before settling down to create your very own masterpiece, with step by step instructions, create this beautiful painting. No Experience Necessary, we promise!" Their events often sell out. Please buy your ticket on Paintclub website. When you purchase, please state "Company" as "Internations" so we can all sit together. Hope to see ya there!